We watched this because Jonathan expressed an interest in it, which drove me to finally reading the book so that I could watch the movie in good conscience. We decided to make a family movie night out of it and Nana came over and joined us in the watching. As I mentioned yesterday, this was my mom's favorite book in third grade so she was interested in seeing the adaptation as well. I really knew nothing about the movie or what to expect of it. (Sometimes I look up reviews but most times I don't.) I did not realize that it was anime. (I'm laughing at myself. You can too, if you like.) I don't care for anime so that affected my outlook right from the get-go. I've only seen a few anime films and I'm just not drawn to it. Also, the story was set in Japan, which I found disappointing as I really like the Victorian England feel of the book. So this film introduces us to the Borrowers in modern day Japan using anime. I was so lost to the story almost immediately. This is not to say that I couldn't enjoy the story anyway, so I told myself to try and like it. I tried. I tried very hard. Shawn is the young man who comes to live at the house where the Borrowers live. He came because his parents were busy with work and he had a heart condition which required having someone around to look after him. 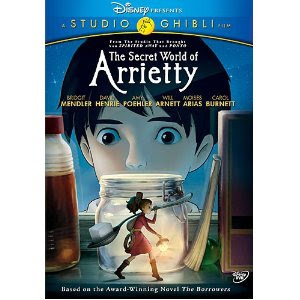 He is lonely and weak and is desperate to mak a friend in Arrietty. She wants nothing to do with him and holds out on him for some time. She's a feisty young woman and much more aware of how dangerous it is for Borrowers to be seen in the film version versus the book. As for the Borrower family themselves, I would say that the movie stayed true to their characters, over all. Generally speaking. Pod is not as old and grumpy in this film as he is in the book. He looks to be in his 40's and is the chief Borrower in the family. However, in the book, the Borrowers feel that the "beans" exist for to provide for the smaller people. In the movie Pod tells Arrietty that they only borrow things that are needed for survival. (Very PC of him, really!) He only takes things like sugar and Kleenex. The house is decorated with flowers and grass from outside. Although there is a little dollhouse in the movie just as in the book, Pod insists that they should not take anything because it is not needed (and the bit about the humans noticing if anything were to go missing). Arriety is allowed outside. In fact, that's where we first meet up with her. She makes a regular habit of exploring the yard and is the one who gathers the flowers for home decor. Homily is caught by Hara and put into a jar. In the book, this doesn't happen. The same studio who produced Ponyo and Spirited Away made The Secret World of Arrietty - so if you enjoyed those two movies you might very well find yourself relaxing with this rendition of The Borrowers. My mom, Jonathan and I agreed that we weren't sure watching this particular version would make anyone want to read the book. I think, given the change of location and time in history, anyone who read the book after watching the movie would be in for something of a surprise! Perhaps per usual, I'm left saying that the book is far better than the movie. However, I hear that there are other film adaptions of The Borrowers out there. Any recommendations as to your favorite?! Thanks for sharing your honest opinion, Carrie! I'll pass. If you want to enlist your readers, I think it would be fascinating to see if there are any movies which are better than their respective books. I am not much of a movie watcher, so I lack the necessary experience. So far, the best candidate I know of is Giant. I was disappointed by Edna Ferber's book (because she seemed to lose interest, and never gave a real ending to the story.) Some time I should watch the James Dean movie. We watched and loved it. It actually made my girls want to read the books. I I think this generation going into the movie and never reading the books, it just might spark their interest. They lost me at anime. Really...really lost me. Interesting changes between the book and movie. I assume Disney wanted to jump on the anime bandwagon and that would be hard to do set in Victorian England. So, sounds like a good one to rent for family night but not bother to purchase.